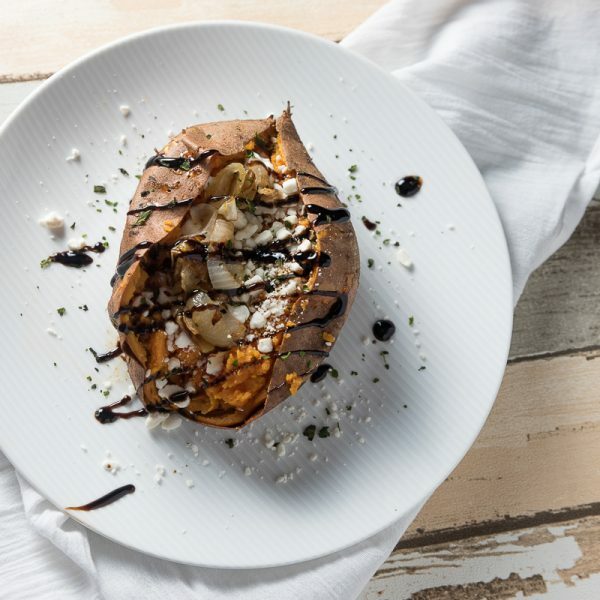 These roasted yams are stuffed with caramelized onions, creamy goat cheese, and topped with a sweet and tangy balsamic reduction. This may be the best savory sweet potato topping yet! I just love baked sweet potatoes. 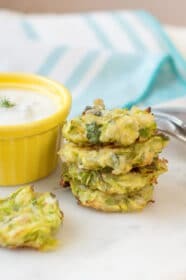 They make for such a simple and delicious meal, and are so easy to pull together at the end of a long day. But sometimes, I want to dress them up a bit too. So tonight, I experimented with these roasted yams and some extra creative toppings! Roasted Yams or Roasted Sweet Potatoes? So first off – what is the difference between a yam and a sweet potato anyway? They are actually two completely different types of tuberous root vegetables. 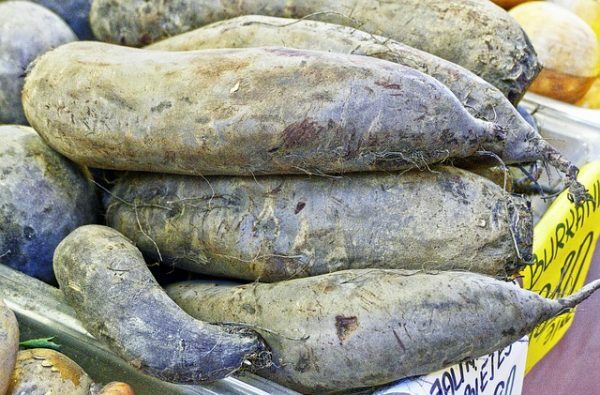 True yams are native to Africa, and it’s uncommon to find them in the United States. They have a purplish brown skin, and the flesh inside can be white, purple, or blue. But most grocery stores don’t concern themselves with this type of detail. They use the terms yam and sweet potato interchangeably. In most cases, the long, orange-skinned vegetable that you think of as a yam, is actually just a specific variety of sweet potato. 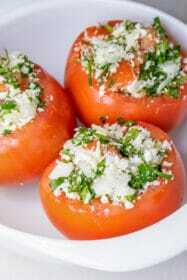 Lucky for us – they taste delicious, regardless of what you call them! 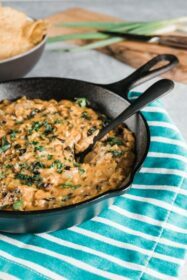 And I love that yams are such versatile ingredients – they are amazing in everything from soups to pastas to quesadillas. 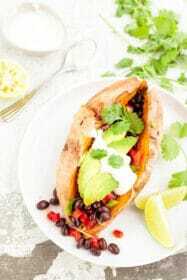 Some of my favorite recipes are these Sweet Potato Quesadillas or these creative Sweet Potato Curry Puffs! These savory roasted yams are incredibly easy to prepare. 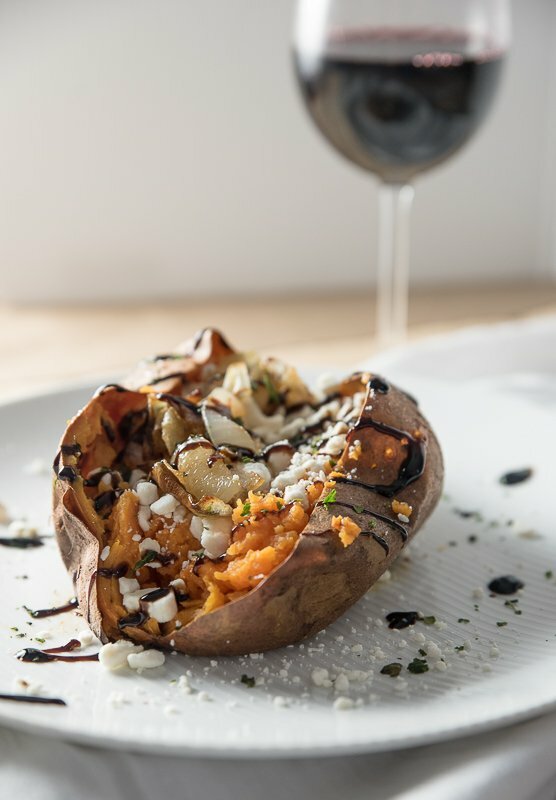 Sweet potatoes (really, all potatoes) are always best when baked in the oven. Of course, you can microwave your potatoes too. But it just won’t have the same effect. Baking gives you that perfect crunchy skin, which contrasts so beautifully with the soft center. So go ahead and bake your yams in the oven for about an hour at 400 degrees. When they are finished, let them cool for about 10 minutes. 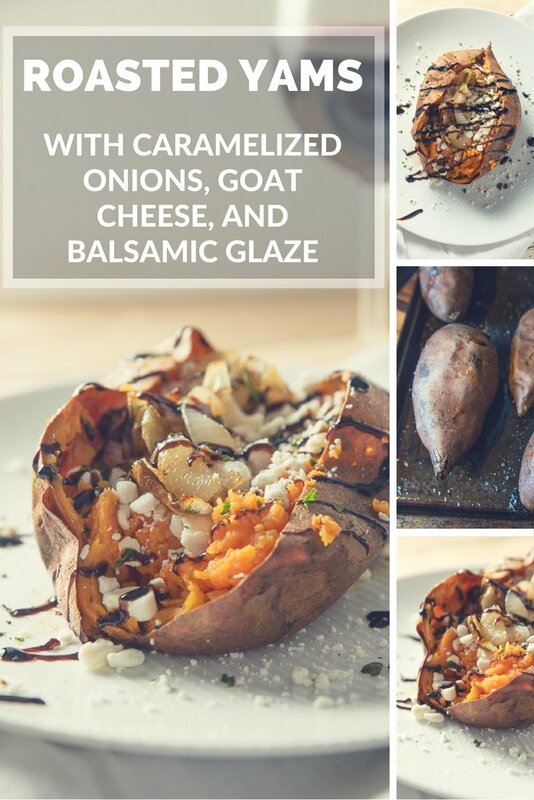 While your sweet potatoes are roasting, go ahead and make the caramelized onions. Simply heat some olive oil in a large pan, and cook some sliced onion over medium heat until they are slightly caramelized. Once the yams are roasted, you simply top them with the caramelized onions, goat cheese, and a drizzle of balsamic glaze. Now if you have the time, you can always make your own balsamic glaze. All you need to do is bring a small pot of balsamic vinegar to a boil, and then cook over medium heat until the liquid reduces and becomes a sticky, sweet glaze. Subscribe to the Delicious Everyday newsletter. I’ll let you know when we have new recipes cooking! 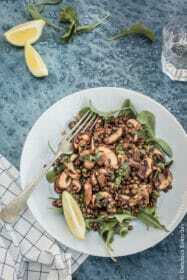 And as a thank you for signing up, I’ll also send you my FREE Vegetarian Pantry Guide, that will teach you how to stock your kitchen for delicious meatless meals. 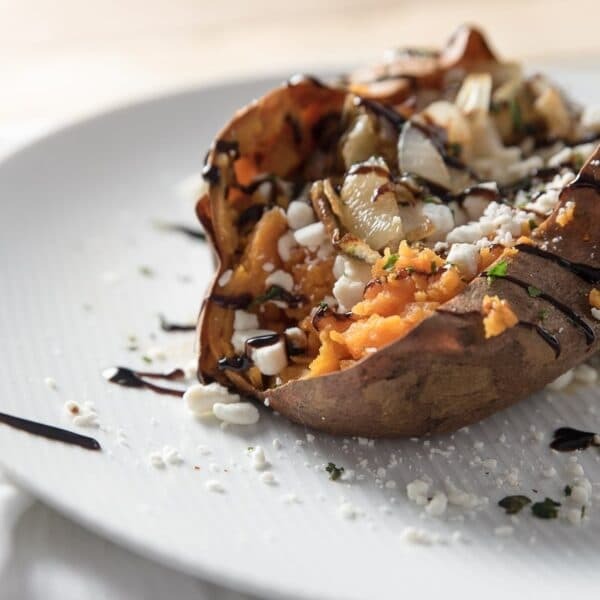 These roasted yams are topped with savory caramelized onions, tangy goat cheese, and a balsamic glaze. Wash yams (sweet potatoes) well. Poke several holes into the yams with a fork. Roast yams in the oven for 40-50 minutes, until softened. Let yams cool for 10 minutes. While yam are cooling, heat a drizzle of olive oil over low heat. Add onions. Cook, stirring frequently, for 10 minutes or until lightly caramelized. Slice open the yams. Top with the goat cheese and caramelized onions. Note: If you want to make your own balsamic glaze, simply bring 1 cup of balsamic vinegar to a boil. Simmer over medium heat for 10-15 minutes, until thickened.